All four Gospels share a story of a woman anointing Jesus. John’s is a bit more detailed and is specifically tied to the siblings Mary, Martha, and Lazarus. Among the Jews in exile in Babylon there is a startling announcement: God is going to do a new thing. It will be just like the Exodus, only in a kind of reversal. This time water will spring up in the desert. “Do not remember the former things,” God says, “I am about to do a new thing.” As we approach Good Friday and Easter we are aware of this renewing energy of God and are about to tell the tale of what we believe to be its greatest work. 43:16 Thus says the Lord, who makes a way in the sea, a path in the mighty waters, 17 who brings out chariot and horse, army and warrior; they lie down, they cannot rise, they are extinguished, quenched like a wick: 18 Do not remember the former things, or consider the things of old. 19 I am about to do a new thing; now it springs forth, do you not perceive it? I will make a way in the wilderness and rivers in the desert. 20 The wild animals will honor me, the jackals and the ostriches; for I give water in the wilderness, rivers in the desert, to give drink to my chosen people, 21 the people whom I formed for myself so that they might declare my praise. Psalm 126 is one of the “Songs of Ascent,” songs sung as pilgrims made their way to Jerusalem for various festivals. Psalm 126 is a great song of hope. Better days in Zion are remembered, but there is a break between verse 4 and verse 5. There has been an intervening time when fortunes were not good (perhaps it is the time of exile that is being referred to). Weeping (a penitential act) is required for joy to return. The Negev is the arid southern portion of the land of Israel, dependent on winter rains. It is used as a metaphor for Israel’s restoration. In the beginning of this letter, Paul has been speaking in highly critical terms of his “enemies,” those who are teaching a different gospel to the Philippians, one that insists on the requirement of circumcision for males. After his initial sense of outrage, he tells a part of his story. He, of all people has “confidence in the flesh,” i.e., his righteousness under the law. Yet Jesus has given him a new lens with which to see life. That lens is Jesus himself and it has replaced the lens of the law. 3:4b Even though I, too, have reason for confidence in the flesh. If anyone else has reason to be confident in the flesh, I have more: 5 circumcised on the eighth day, a member of the people of Israel, of the tribe of Benjamin, a Hebrew born of Hebrews; as to the law, a Pharisee; 6 as to zeal, a persecutor of the church; as to righteousness under the law, blameless. 7 Yet whatever gains I had, these I have come to regard as loss because of Christ. 8 More than that, I regard everything as loss because of the surpassing value of knowing Christ Jesus my Lord. For his sake I have suffered the loss of all things, and I regard them as rubbish, in order that I may gain Christ 9 and be found in him, not having a righteousness of my own that comes from the law, but one that comes through faith in Christ, the righteousness from God based on faith. 10 I want to know Christ and the power of his resurrection and the sharing of his sufferings by becoming like him in his death, 11 if somehow I may attain the resurrection from the dead. 12 Not that I have already obtained this or have already reached the goal; but I press on to make it my own, because Christ Jesus has made me his own. 13 Beloved, I do not consider that I have made it my own; but this one thing I do: forgetting what lies behind and straining forward to what lies ahead, 14 I press on toward the goal for the prize of the heavenly call of God in Christ Jesus. All four Gospels share a story of a woman anointing Jesus. John’s is a bit more detailed and is specifically tied to the siblings Mary, Martha, and Lazarus. Jesus has, in fact, just raised Lazarus from the dead (ch. 11). They now share a meal as good friends would (it has earlier been made clear that there is a special relationship between Jesus and this household). The tale contrasts Mary and Judas, the faithful one and the unfaithful one. 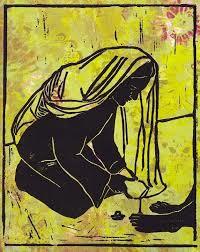 Anointing Jesus’ feet may be a foreshadow of Jesus’ washing of his disciples’ feet in ch. 13. Jesus indicates that she is anointing him for burial. The saying about the poor at the end of the passage does not mean that we should not care about them. Rather, it is Jesus contrasting their presence with his impending absence. The perfume called “nard” comes from a plant native to India (the word itself is Sanskrit in origin). It was extravagantly expensive and was most often saved for weddings and burials. Three hundred denarii (a Roman coin) was about a year’s pay for the average worker of Jesus’ day. The readings are taken from The New Revised Standard Version of the Bible © 1989 by The Division of Christian Education of The National Council of Churches of Christ in the U.S.A. The translation of the Psalm is from The Book of Common Prayer. Commentary on the readings is copyright © 2019, Epiphany Esources, 67 E Main St, Hornell, NY 14843, www.epiphanyesources.com. All rights reserved. Permission granted to copy for group study with attribution. Bulletin inserts are available. Visit our website for more information.